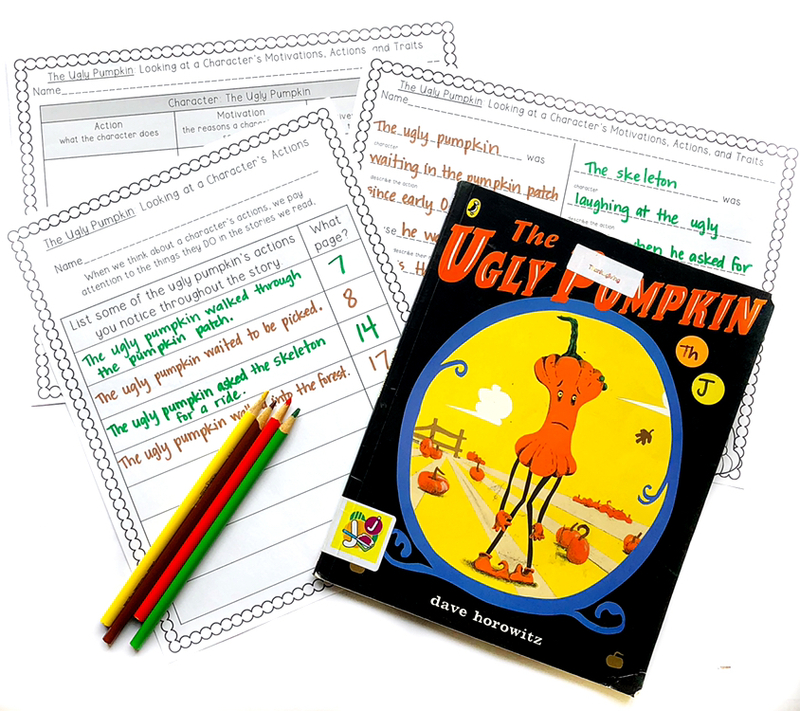 The Ugly Pumpkin by Dave Horowitz is a book you can carry across October and November, and I have the best time reading it to my kids each year. It is perfect for teaching readers how to examine a character's actions, traits, and motivations. I usually spend a whole week with this book, and slowly scaffold character actions, traits, and motivations as we go. Before reading, I always do a quick review on what it means to think about someone's actions. 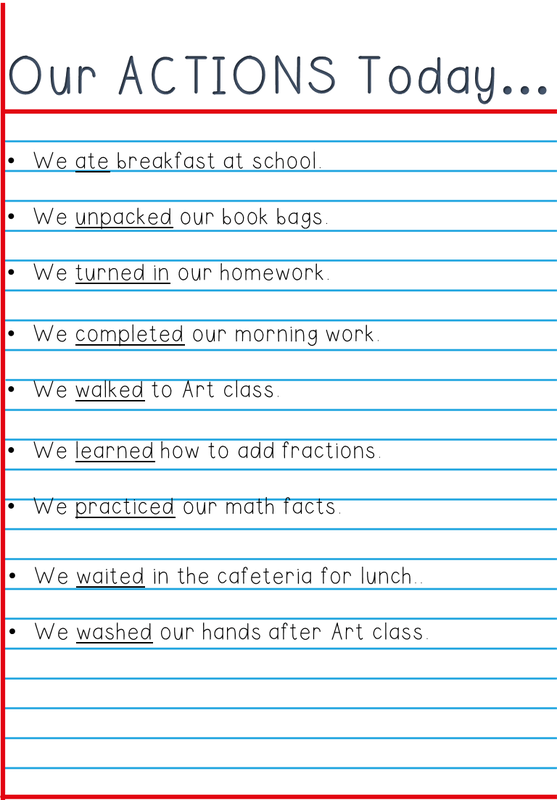 We use a piece of chart paper to make a list of the things we've done since we arrived that day. The kids are listening for actions, and afterwards we go over the day's reading response. You may want to fill in an example (or two) with them. I really emphasize writing in complete sentences because they'll be expected to do the same as the week progresses. In the days that follow, we move on to examine a character's motivations and traits. What my students and I love about these lessons is that each written response builds on information we gathered about the character the day before. All they have to do is transfer the information to make the connection. I encourage them to go back to the previous day's response to get their assignment started. It's less than 2 minutes long - perfect for a quick review! On Day Four, we connect everything together in a sentence frame response. I love being able to have them go back to this activity when they begin to write responses about characters using their independent books in the weeks and months ahead. As I was looking through this pack, I decided to add on an extra day where I could invite the students to step into the character's shoes. I can't wait to try these responses out in the next week or so. I think I'm going to use them to create a fun hallway display and have the kids mount them on construction paper. I've included a sample of the activities in this unit in an EXCLUSIVE freebie sampler pack. Just sign up below to grab your own download! Subscribe to get a FREE sampler from my Ugly Pumpkin unit! If you'd like to know more about the rest of the activities in this pack, keep reading! and an Ugly Pumpkin writing craftivity! You can find it on TpT - it's on sale for a limited time! Click HERE or on the image below to grab it! Make sure you check out the rest of the fall mentor text lessons and snag the freebies we're sharing with you this week. 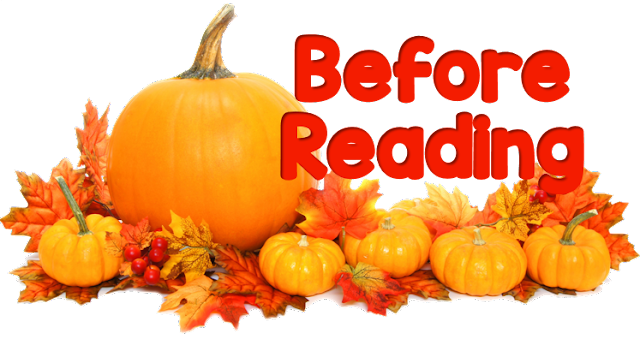 Stop by the rest of The Reading Crew's posts to continue gathering phenomenal ideas for fall mentor texts! Short on time? Pin this post for later! Is the freebie still available? I'm so sorry the link isn't working! I think I've solved the problem! Halloween Treats ~ A Resource Round-up!